This year the Bowling Green Fire Department will be offering its Honor Guard Basic Camp from September 25-29, 2017. You may register online or mail us a completed registration form along with an enclosed check. The deadline to register online is August 31, 2017. If registering by email, your form must be postmarked no later than August 25, 2017. The camp is limited to thirty (30) participants maximum. Deadline for camp registration is August 31, 2017. If fewer than ten (10) registrations are submitted by the deadline, the class will be canceled and all payments will be returned to sender(s). 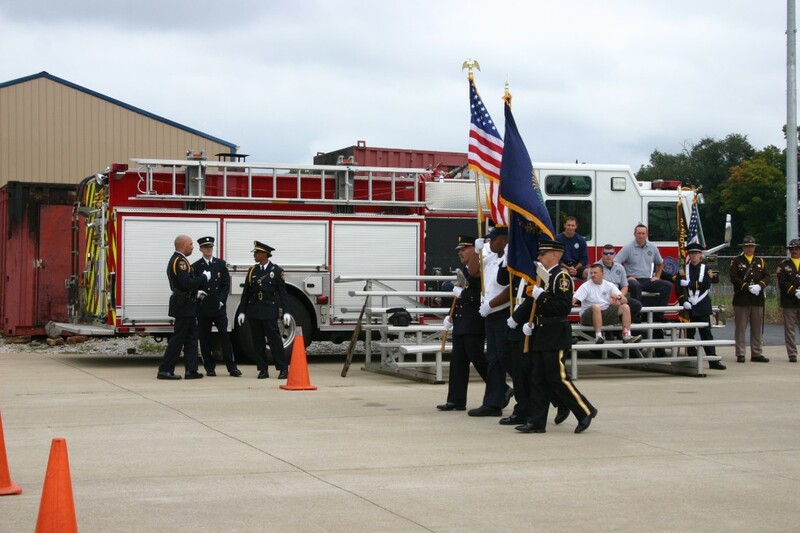 The BGFD Honor Guard Basic camp is designed for Police, Fire and EMS departments looking to start an Honor Guard as part of their organization or for departments who may have formed an Honor Guard, but need to hone basic skills. It is a great venue for learning the skills necessary to provide HG services to your respective communities. Skills such as flag presentation (posting or presenting flag details) for department or community events, parade details and honors funeral services are all key ingredients to a polished Honor Guard program. Bring long pants (typically your duty uniform pants) to wear with shirts/sweatshirts provided by the camp, station shoes (comfortable for extended standing and walking). Our camp uniform will be t-shirt/sweatshirt (provided), station pants, station shoes, ball cap (provided) and I.D. lanyard (provided). Also, bring any department flags, decommissioned weapons (ceremonial rifles, axes, pike poles, swords, etc) and Class-A (Dress) uniform with any accessories. Also, bring civilian clothes and toiletries for after-hours. Snacks are welcomed as long as they're not intrusive or distracting to other students and drinks are okay provided they are managed. This course involves hands-on skills both indoors and outdoors, so a drink that can be spilled would need to be relocated and/or sealed prior to performing such skills. We ask that cell phones be kept on silent or off during the instruction portion of the class. It is distracting to other participants and hinders learning of important information. Breaks and lunch will be provided which will allow for catching up on calls, texts or other digital needs. Yes. In the event you cannot make the camp, you can transfer your individual (or group) registration to another person. Will I get training hours for this camp? Yes, Kentucky firefighters will receive (upon request) a KFS-1b Training Notice for 40 hours in Special Topics in Firefighting (Course Code: II0000) as well as a certificate of completion for any/other outside agencies to attach to their department training forms. Is this a physically demanding camp? You wouldn't think so, but YES it is. Please consider this prior to registering. Most of the camp is live demonstration and hands-on skills. Expect to be on your feet most of each day (standing in formations, executing facing and marching movements). Carrying flags and weapons and some heavier lifting will be required.